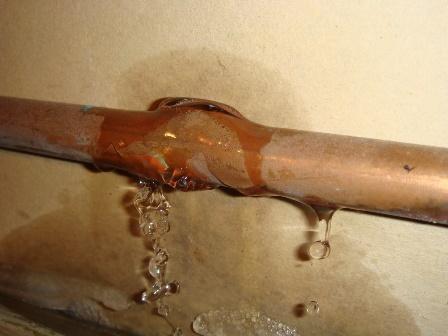 Having a burst pipe is considered an emergency plumbing wise, as this can cause extensive damage to your property and even electrical wiring. 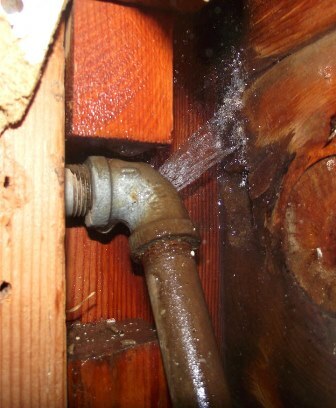 As soon as you notice this plumbing problem, give us a call on our 24 hour plumbing line! Drain the plumbing system by opening all the cold water faucets and flush all the household toilets. Switch off the geyser (including any other water heating systems). Once this is done, open all the warm water faucets and drain the system. Should the burst pipe be located close to electrical appliances, turn off the main switch on the electrical board immediately. If the leak is coming from the ceiling, punch a small hole with a knife or screwdriver and let the water drain into a bucket. 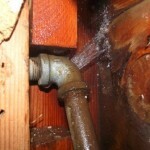 If the ceiling is bulging all ready, it is safer to get a plumber ASAP. To temporarily stop a pinhole leak, apply pressure to the opening. For small leaks, you can use duct tape. Put the stationary part of the opening of the clamp against the pipe and screw the clamp against the wood. Tighten until the clamp is secure. If you go on vacation for a few days, shut off the water supply to your home and drain the pipes before you leave. 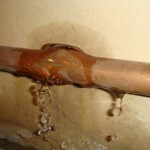 We are 24 hour plumbers, call us on our 24 hour plumbing line and we will easily resolve this plumbing problem for you.